Many Doctor Who fans, sleep deprived after a night of marathoning The Trail Of A Time Lord, tearstained from the umpteenth viewing of Doomsday, or dizzy from trying to figure out the plot mechanics of The Wedding Of River Song, have probably idly dreamed about finding the TARDIS and running away with the Doctor. 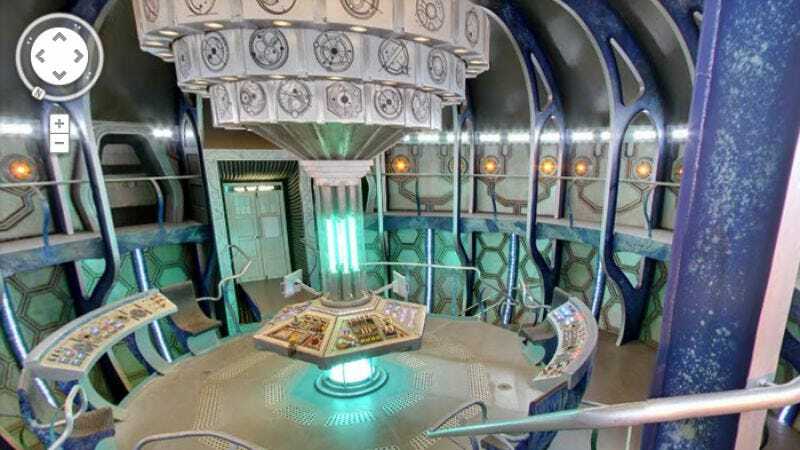 Thanks to a clever easter egg on Google Maps (run you clever boy), Journey To The Centre Of The TARDIS is no longer just an episode of the show’s seventh season, it’s now a reality. By visiting the Google Maps page for Earl’s Court Rd, London and clicking on the double arrows pointed towards an innocuous blue police box, would-be-companions can venture inside the TARDIS. From there the streetview program offers quite a bit of room to explore—it’s bigger on the inside, after all—including multiple levels of the control room. Whovians everywhere can now join hands in a glorious Ood song as they search for the Chameleon Circuit, glance into the TARDIS’ heart (BAD WOLF), and shout “allons-y” while frantically clicking around trying to find that damn swimming pool everyone is always taking about.